Early adopters are like pioneers, braving new uncharted territories by implementing exciting new technologies into their organizationsâ€™ infrastructures. Those who implement the same technologies later can learn much from these early adopters. 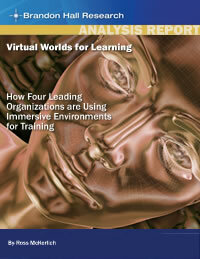 “Virtual Worlds for Learning: How Four Leading Organizations are Using Immersive Environments for Training” provides case studies of how four companies, IBM, Johnson & Johnson, Paideia Computing, and TELUS Communications have implemented this emerging learning technology.